Ergonomic baby carriers are a fine option for parents who are aware how significant being close to the baby, touching the little one and paying attention are as regards the development of the child. Designed with care as regards every detail, it provides the child with safety and anatomically correct position. Moreover, this product ensures comfort and freedom of movement for the parent. 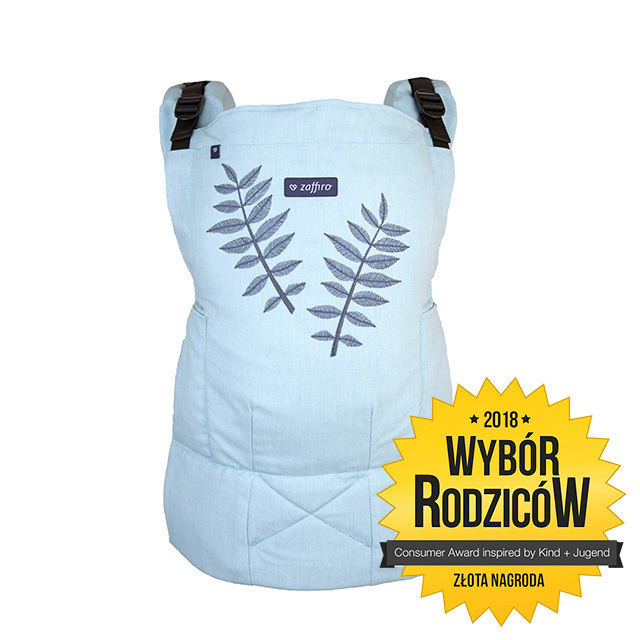 It is more comfortable when we are taking care of older, heavier children (wide, comfortable arms and specially shaped hip belt) and slightly easier to use than baby slings. 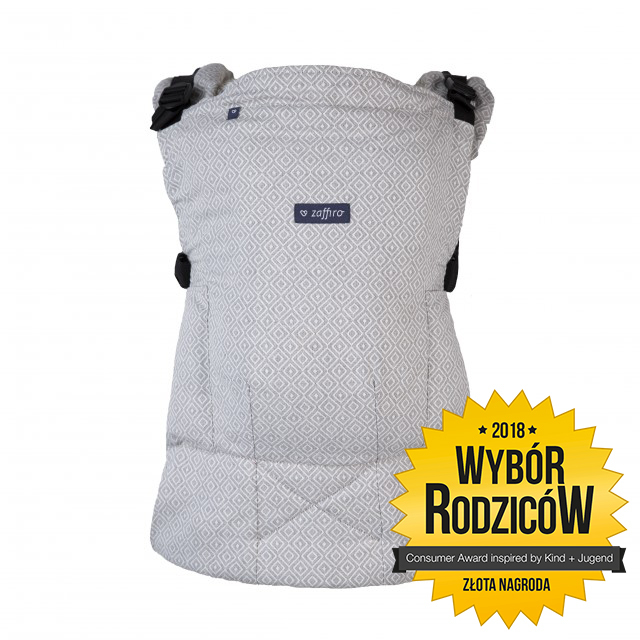 Zaffiro Smart is a adjustable baby carrier that grows with your baby. 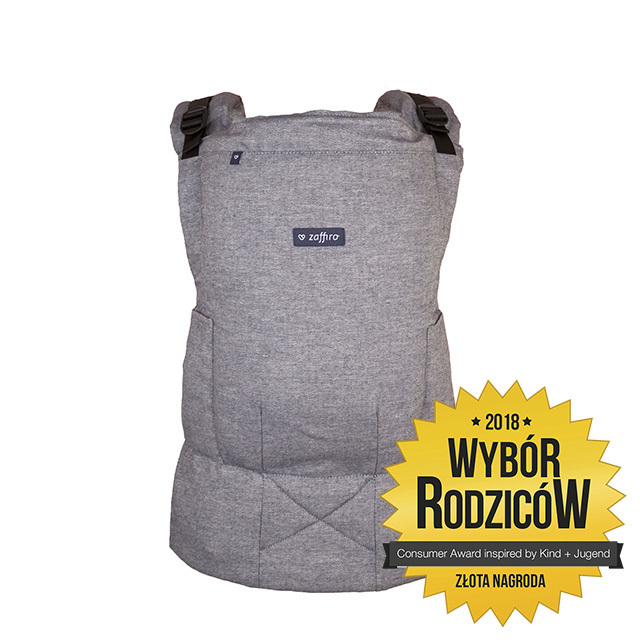 Thanks to the option of adjusting the height and width of the panel, it allows you to maintain the ergonomic position of both the baby and the larger child. 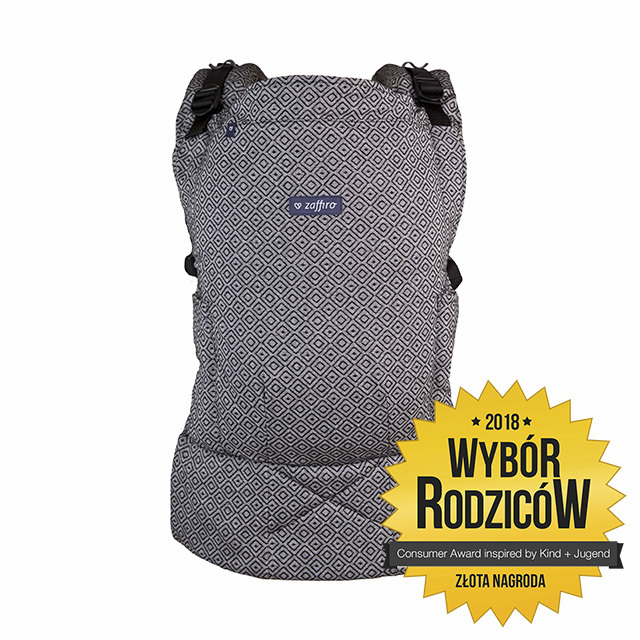 Zaffiro Smart adjustable baby carrier received a prestigious Parent's Choice 2018 award. It means that it has been appreciated by the most important people, that is our clients. 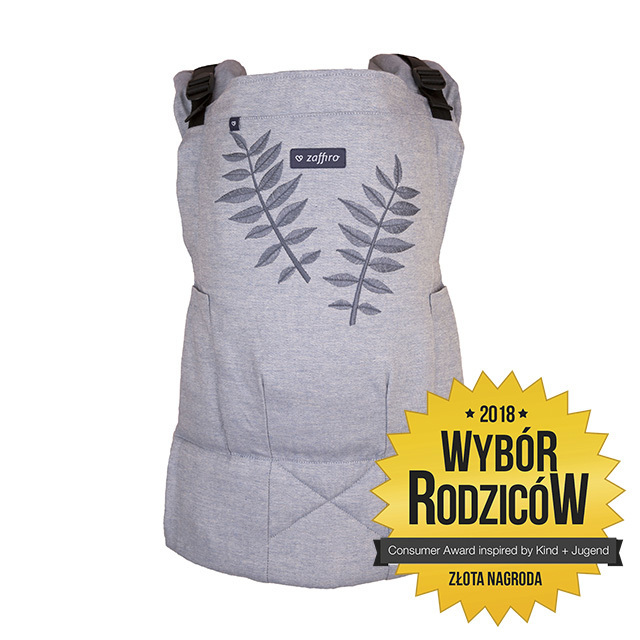 The Parents' Choice contest promotes the most interesting products for children in Poland and on international markets. 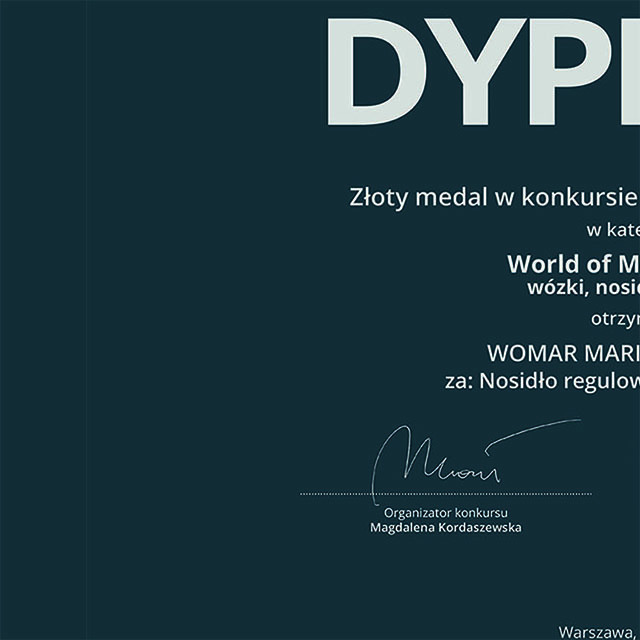 The organizers of parenting service: Wyborrodzicow.pl and the magazine "Branża Dziecięca" in cooperation with the largest and most prestigious children's fair in Europe, Kind + Jugend in Cologne will give international awards to products chosen by consumers. If we want the baby carrier to last longer, consider buying an innovative Zaffiro SMART adjustable sling. It is a carrier in which we can adjust both the width and height of the panel. Thanks to this, the sling will fit smaller and larger children at the same time. The SMART baby carrier grows with baby, adapting to his needs and providing him with an ergonomic position at every stage of development. Another great solution is the method of fastening the shoulder straps. We can normally attach them to the panel or additionally to the hip belt. This gives you the opportunity to better match your parent and baby. The advantage is also that the shoulder straps can be put on as a backpack or a cross, which guarantees greater comfort. The Zaffiro SMART baby carrier thanks to its adjustment system is universal regardless of the wearer's body shape, as well as the baby. It works great with baby's body, it is easy to put on and extremely comfortable. Shoulder belts have a soft filling, thanks to which baby seems twice as light. The possibility of fastening the shoulder straps in various combinations makes the baby carrier very functional. 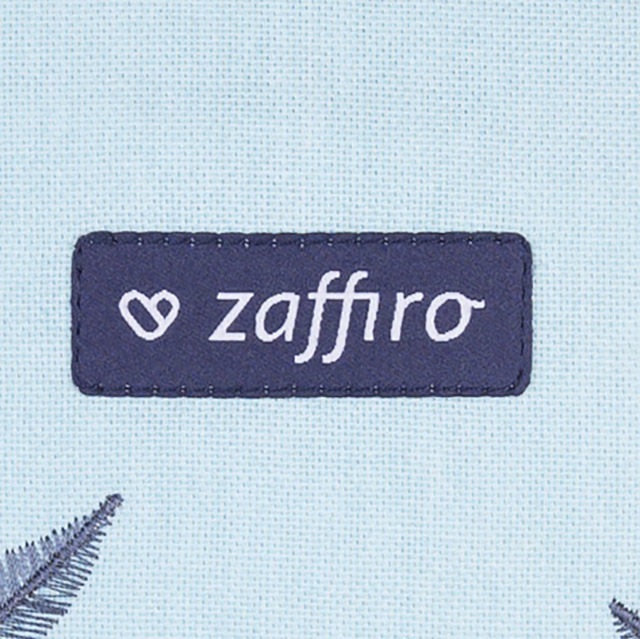 The Zaffiro SMART baby carrier is the perfect solution for every parent. 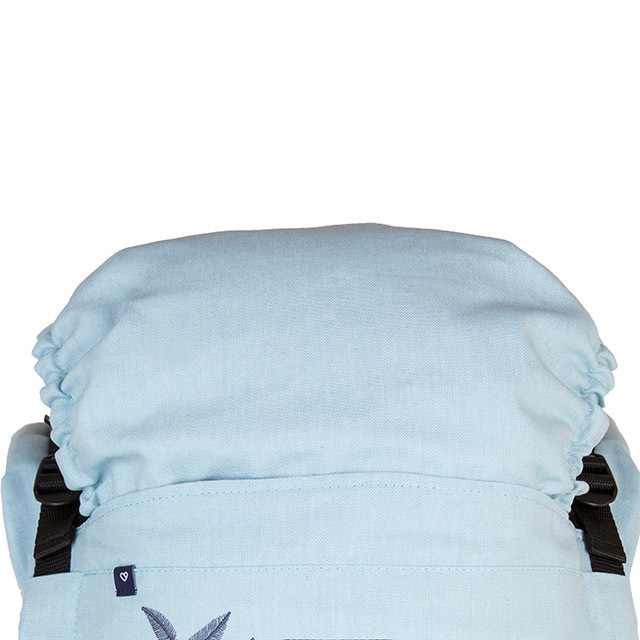 Comfortable and soft straps relieve the parent's spine and increase comfort of carrying. Depending on your preferences, you can cross the straps on the back. The reliable three-point hip belt buckle manufactured by the world brand Duraflex is equipped with a lock protecting it from accidental unfastening. 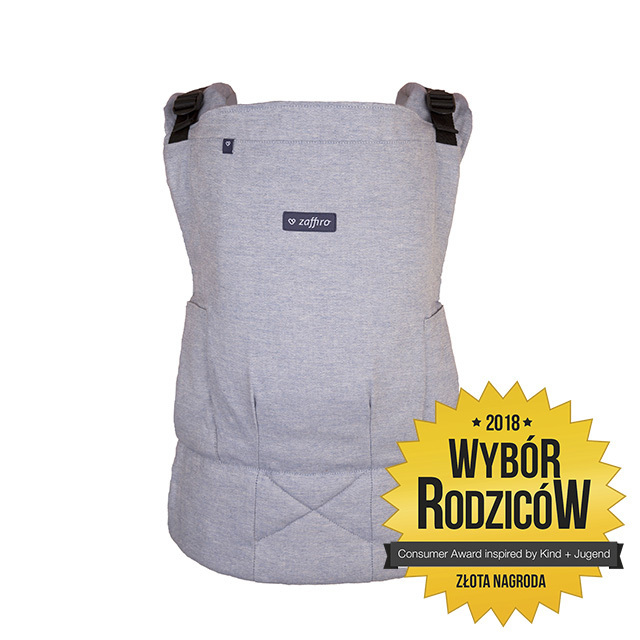 The special design of the profiled hip belt combined with a wide carrying strap and the solid, sturdy buckle guarantee your child's safety when he or she is being carried around. The carrier is designed in such a manner that the child's legs are set apart and that supports the development of the hip joints. On the other hand, the wide and soft panel covering the baby's back maintains the anatomical shape of the spine. At the same time the soft collar (headrest) serves as the support for the baby's head. Zaffiro carriers comply with the latest European Safety Standards CEN/TR 16512:2015. They are made of anti-allergenic materials representing the highest quality, confirmed by certificate OEKO-TEX Standard 100, restricting the permitted levels of harmful formaldehyde, phthalate and BPA. They are recommended by the Foundation "Gift for the smallest". The height (29 - 42cm) and width (25-40cm) of the panel can be adjusted to baby's development at various stages. 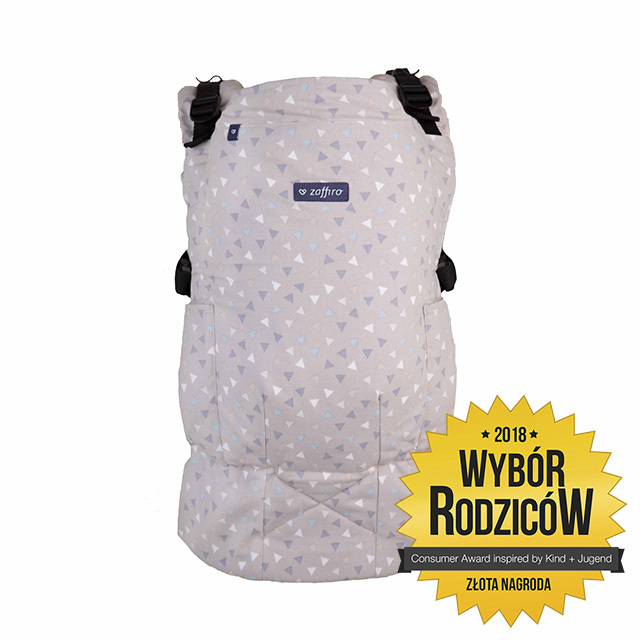 What makes the SMART baby carrier the most universal baby carrier from our offer. 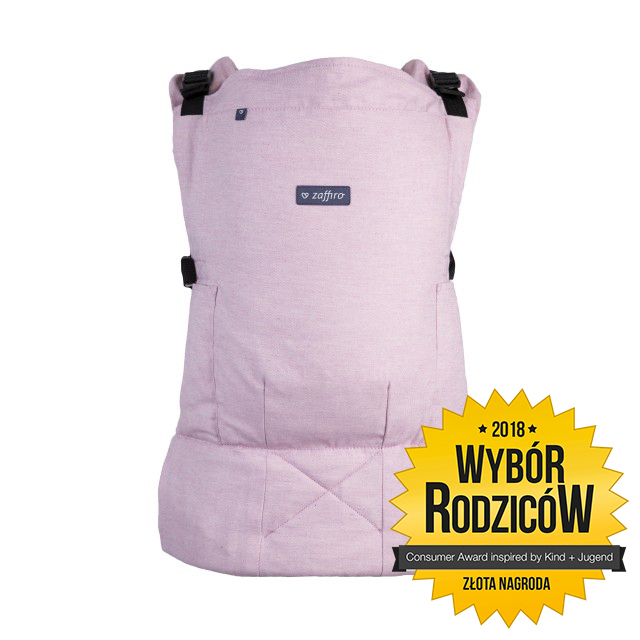 You can use it for the third year of life or up to 18kg, so you do not have to worry about the fact that your baby will grow out of the baby carrier. Two methods of fastening the shoulder straps, depending on baby's age, make the baby carrier adjust even better to baby. We use the hip belt fastener from the fourth month of life, it ensures the natural position of the spine. This is important because the spine of baby is still developing, and too early upright siting position can contribute to the defects of the baby's spine and hips. We start to use the half-panel fastener when baby's muscles are strong enough and he can sit on his own. Specially designed pockets allow you to hide unused fasteners. From the moment we come up with each concept till the last phase of its execution we work in a team of well-known designers. Thanks to their experience and openness to the requirements of our customers, we manufacture products combining innovative and functional design with the beauty and elegance. We try to follow the latest fashion trends but we also come up with new fabric patterns. Moreover, we often patent design solutions. Our products are manufactured exclusively in Poland, using technological lines offering the highest quality as regards the execution. We select the raw materials carefully and consciously as they have to correspond to the most stringent standards in force in the European Union. We want not only with create beautiful and fine designs, but first of all to support the concept of conscious parenting, taking care of what is the most precious thing between a parent and a child. 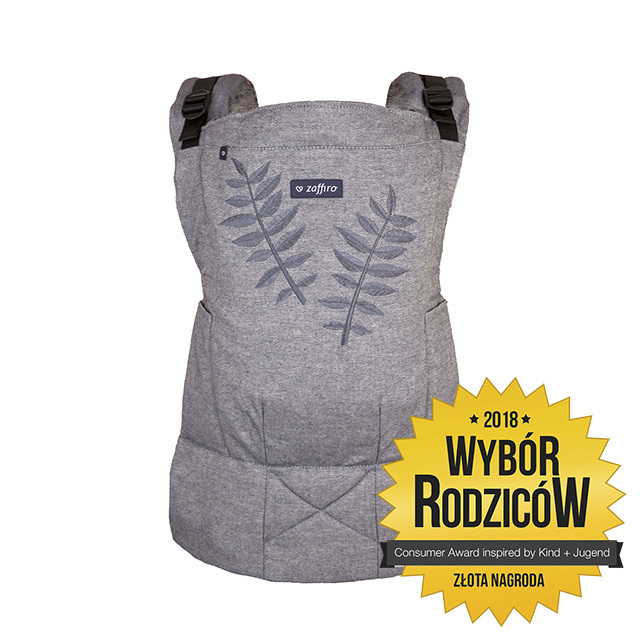 In the adjustable baby carrier you can carry baby from 4 months of age, thanks to the adjustment option there is no need to use additional inserts. This is the time when baby is holds his head by himself. The health and proper development of your baby are of utmost significance from our perspective. We suggest you consulting your paediatrician as regards the use of the baby carrier and how to carry the baby, as the developmental defects concerning the baby and some somatic symptoms can constitute counter-indication.